Choose your own love words for a truly personalized wedding invitation. Forever, Love Infinitely, Love, Amour and any word that pops into your head when you think of love. 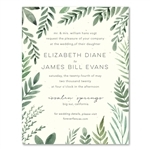 This gorgeous seeded wedding invitation from ForeverFiances creates a custom and unique feel. Printed on 100% recycled, seeded paper which blooms into wildflowers (once planted). Printed in San Diego on seeded paper. Custom color(s) welcomed. I loved the care and attentiveness that was put into my wedding invitations. Great customer service, it really feels like you guys put a lot of effort into making sure your customers happy. THANK YOU SO MUCH!